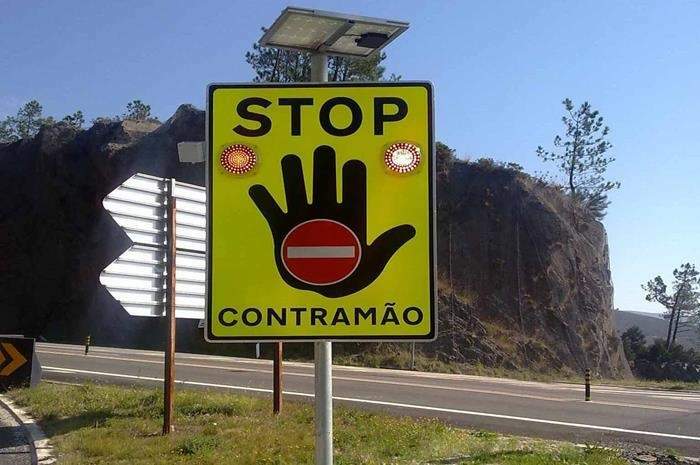 SERNIS is a Portuguese technologic solutions company that manufactures a wide range of high-quality road safety solutions in the fields of electronics displays, fibre-optics and light-emitting diode (LED) lighting. Certified with ISO 9001: 2008 and accredited by Switzerland’s Société Générale de Surveillance (SGS), the company’s portfolio includes road studs, flexible bollards, variable message signs (VMS), controllers, intelligent traffic systems (iTS), and LED signs and traffic lights, which combine innovation, efficiency and high-performance. 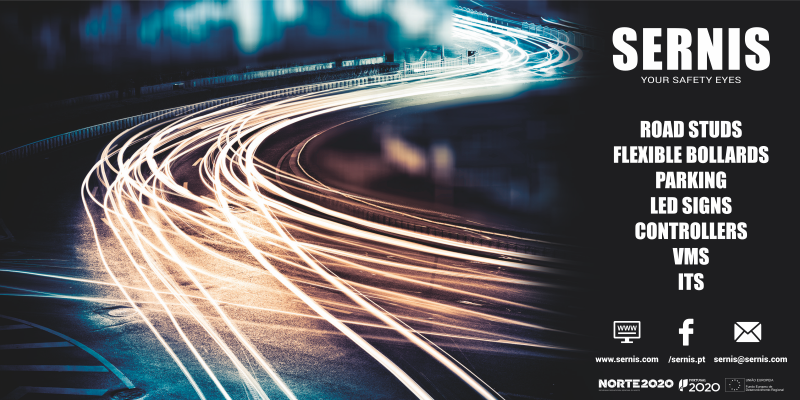 SERNIS road studs have been at the forefront of innovation and technology road safety over the past 20 years, making them suitable for a wide range of applications and conditions. Combining versatility, luminosity and durability, all SERNIS studs are reliable and 100% waterproof. 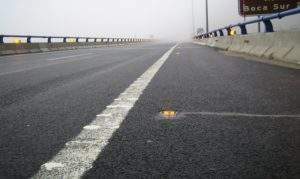 The company’s hard-wired power light road studs are suitable for adverse conditions such as snow or fog and provide high-brightness during day and night. The high-quality SR-45 (unidirectional) and SR-48 (bi-directional) studs are created to resist adverse conditions. The SR-50 is the most powerful, resistant and flat road stud on the market. 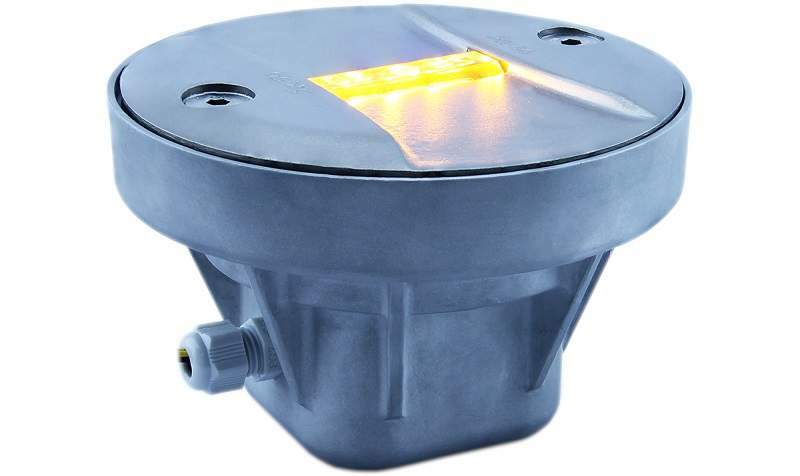 It can be rotated after installed so clients can adjust the road stud light direction after installation. With a 360º light view, the SR-70 is specifically developed for airports for airplane parking. 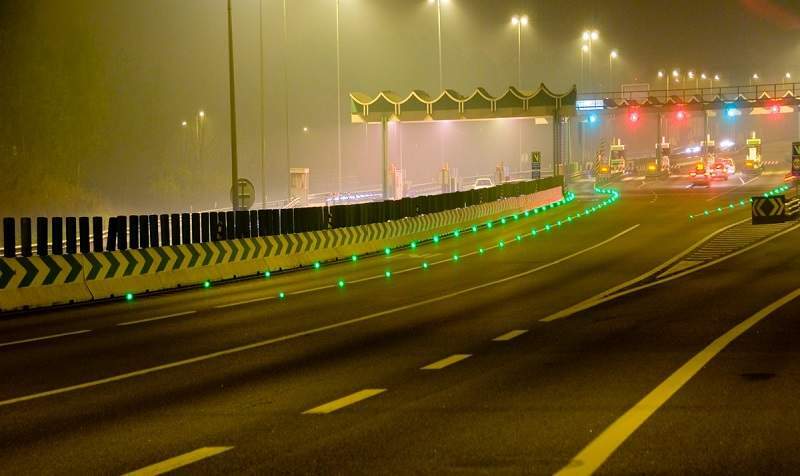 Already operational at Lisbon Airport, it offers high mechanical strength and supports up to 135t. 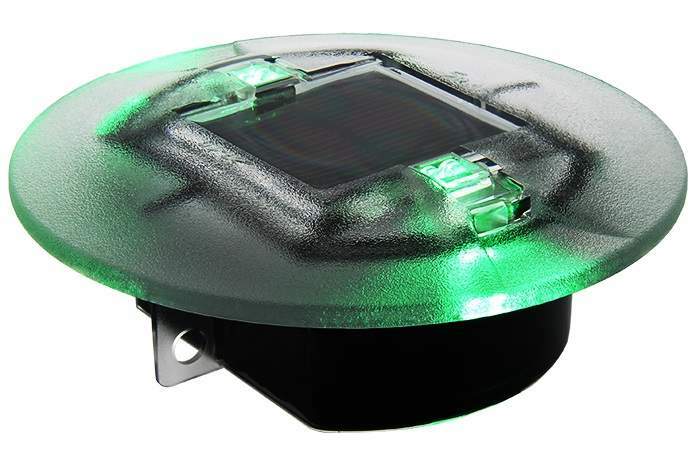 SERNIS’ solar studs have low-power consumption and high-autonomy. They absorb sunlight and convert it into electricity. At night, it will then function without an external power source, maintaining constant brightness. With visibility up to 1km, the SR-15 and SR-20 are ideal for locations without accessible power. Specially developed for cycle paths, the SR-35 also has 360º lighting to provide guidance and warning to cyclists and drivers. The solar studs also go into sleep mode after 24 hours without being activated so they can be stored for long periods without reaching critical power levels. Designed for tunnel applications, the SR-T24 requires no maintenance and is easy to replace. 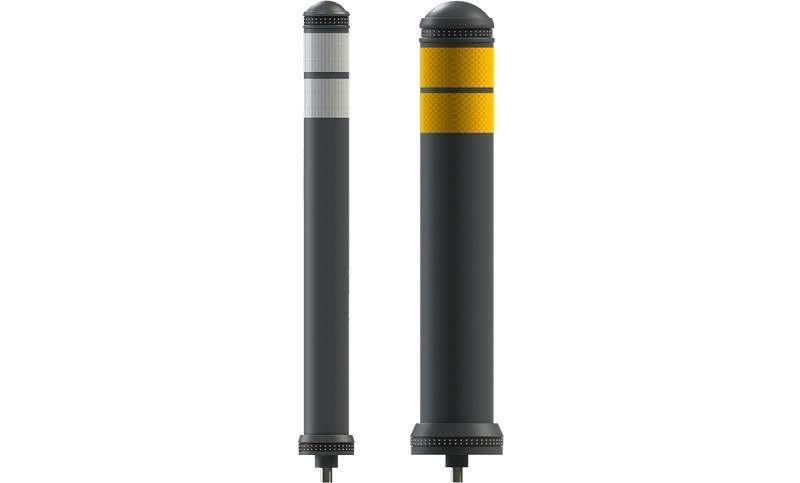 SERNIS’ SR-BALI flexible bollards feature an impact-resistant body and high-memory material. 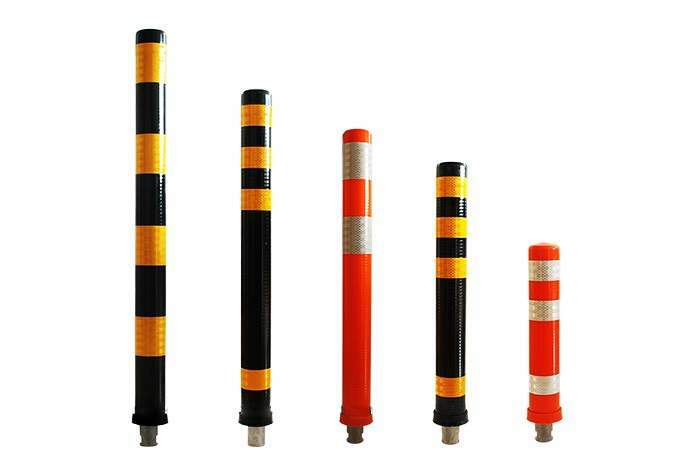 The bollards are ideal for delineating traffic lanes and improving road safety, as they significantly reduce the average speed and disallow dangerous actions as overtaking or changing lanes. Its versatility makes them ideal for safety and protection applications in roads, highways, urban places and public streets. The SR-CITY-BALI is ideal for urban area delimitation and is available in diameters of 80mm and 130mm. It also features 3M reflective tape to enable increased visibility at night. These bollards strengthen separation and cohesion in landscape design while enhancing pedestrian safety and walkability. The SR-BALI-LF is resistant to light and heavy vehicles, making it ideal for area delimitation and road delineation applications. All bollards feature UV protection to minimize maintenance and prevent fading in sunlight. Its flexible construction is able to absorb the impact. When struck, flexible bollards typically blend 90° to ground, reducing damages to vehicles and surroundings surfaces and return to their original, upright position. Product test report results showed that after 1,000 hits, bollards return to their original position. 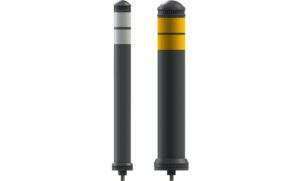 SERNIS’ easy-to-install bollards are made from durable and rigid polyurethane to ensure a long-lasting performance. 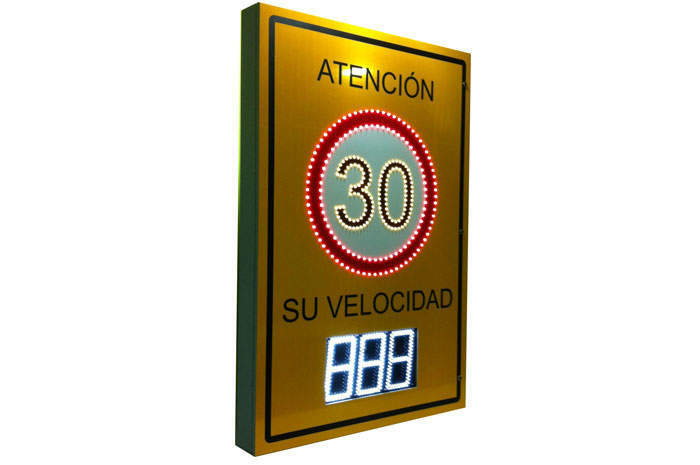 SERNIS has a wide range of LED road signs featuring high-quality material such as 3M diamond grade reflectors and Nichia LEDs. This ensures the LED signs have high-durability and brightness. In addition to standard products, SERNIS offers customizable signs as per the client’s request. SERNIS has several varieties of VMS. The company also manufactures and customizes any type of VMS. The SERNIS traffic radar system has traffic enforcement speed and monitoring data for precise recording of speed violations and prevention of traffic offences. Available in fixed and portable versions, both variants have real-time image visualization and remote access communication. 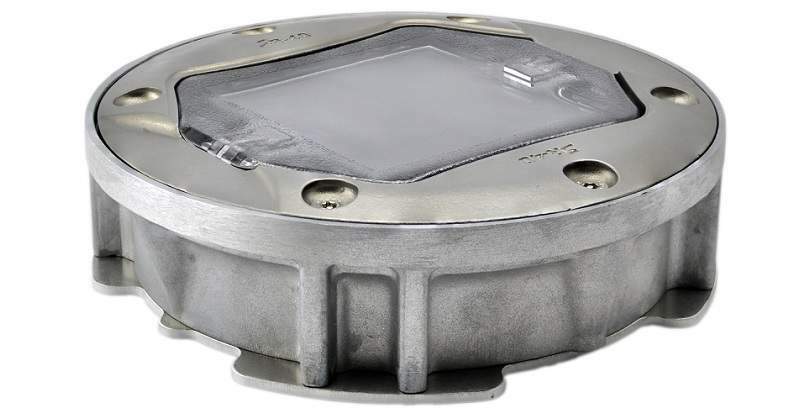 SERNIS’ LED luminaires offer high-performance lighting with low-energy consumption. They can also replace conventional luminaries without implementing new infrastructures. 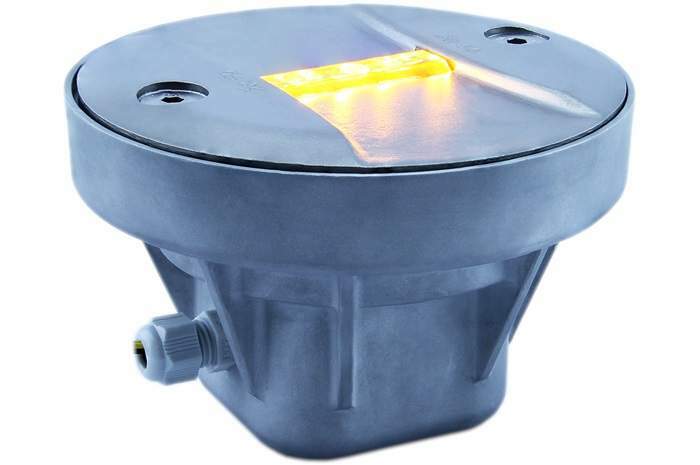 The company also offers LED floodlights for outdoor and tunnel applications, as well as crosswalk lighting. The SR-TICS thermal technology-based system detects pedestrians at crosswalks by real-time image processing. 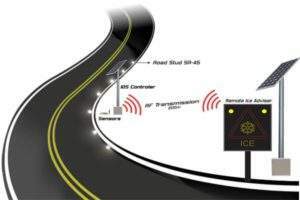 This automatically manages the activation of a set of warnings through vertical signs and road studs to safely and effectively alert drivers. The SR-TICS have a thermal camera that doesn’t see sun glare responding only to the heat signature, providing 24h vehicle detection regardless of the amount of light available, reducing the risks of accidents in crosswalks. The SR-TICE thermal technology system can help people with visual disabilities to decide to cross pedestrian crosswalks that do not have traffic lights. The blind person must use a special cane or a smartphone with an app installed with a vibration system that will alert them to the presence of the system. It will vibrate in three different ways: when there are no vehicles on the road (on both sides), when the cars are approaching and the pedestrian must not pass and when the cars stopped and the pedestrian can cross. To ensure greater reliability, this system also has a thermal camera that doesn’t see sun glare responding only to the heat signature, detecting and giving 24h detection of vehicles, regardless of the amount of light available. The SR-IDS integrated system detects the possibility of ice formation on roads and alert drivers with visual warnings so they can reduce their speed and drive carefully. The solution accurately monitors the possibility of ice formation for drivers, and the Outdoor and Indoor Parking System with real-time image processing helps drivers to find parking spots. The system consists of a transmitter that analyses the information before transmitting it to the receiver. Whenever there is a possibility of ice formation, the receiver triggers the warning system, which keeps operating until effective temperature and humidity re-stabilises. The SR-TWWID offers real-time detection for vehicles driving in wrong way. Vehicles in the wrong direction represent a serious risk to road safety. The aim of SR-TWWID is aware drivers in the wrong way of the risk in order to get the vehicle in the correct direction before a serious incident happens. One important area of focus for Smart Cities is Road Safety. Globally, one life is claimed in a traffic accident every 25 seconds. Intelligent solar road stud, ideal for road delineation, bends/curves, crosswalks among others applications. The SR-40 road stud is ideal for countries with low sun exposure due to its high-performance photovoltaic solar module. The SR-50 road stud can be rotated after installed (allowing you to adjust the road stud light direction after having been installed on the road). The SR-70 is a 360º hardwired road stud with programmable LEDs that can be seen from all sides. SERNIS offers a wide range of traffic management solutions, including 3D data traffic controllers, LED signs and hardwired road studs. SR-90 - the Intelligent System for Physical Speed Reduction - developed by SERNIS won the Safety category of the prestigious Intertraffic Amsterdam Innovation Award 2018. SERNIS have a large range of road safety solutions for snow / icy roads. SERNIS now offer a larger Flexible Bollard SR-BALI, with 130mm of diameter for better visibility over large distances. SERNIS's new Flexible Bollard SR-CITY-BALI is ideal for urban areas delimitation and is available in two diameters: 80mm and 130mm. The new SR-50 road stud from Sernis is now available for purchase. Sernis road studs now feature a vertical light, which has been specifically designed to illuminate historic areas and pedestrian zones. SERNIS solar road studs have a new feature: after 24h without being activated, it goes into SLEEP MODE. Sernis has launched the IL-LSL-192W, a new intelligent luminaire that is the most powerful of its range. 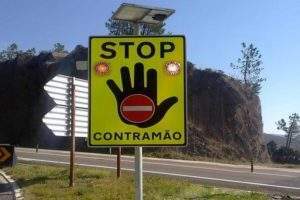 SERNIS was nominated with the innovation award for TranspoQuip, the largest fair of Road Safety in Latin America. The B-Rail was one of ten award-winning products with TranspoQuip Innovation Award, being recognized as one of the most entrepreneurial industry solutions. 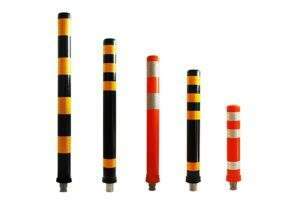 Flexible bollards are a useful tool to delineate traffic lanes and improve road safety. The application of bollards can significantly reduce the average speed and disallowing dangerous actions as overrunning or changing lanes. Sernis launched a new concept of solar road studs, the i-stud evolution. This new technology is applied to the SR-i15 and SR-i20 studs and enables countries with severe winters, adverse temperatures or low solar radiation to take advantage of solar-powered studs. 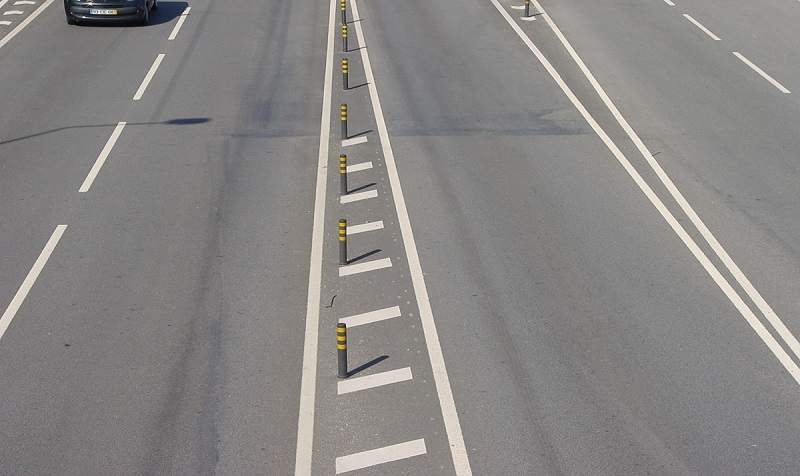 Sernis' Road Studs are one of the most popular products worldwide providing high performance solutions for delineation, guidance and warning. The company has a wide range of road studs, designed for different applications and low power consumption - solar power, wired systems, high brightness, powerful strength. Sernis developed a device to monitoring and manage parking lots in outdoor environments through real time image processing. The SR-OPS Outdoor Parking System has the same high performance as sensors network embedded in pavement, a single camera can monitoring simultaneously up to 50 parking lots which ensures a lower price per place. 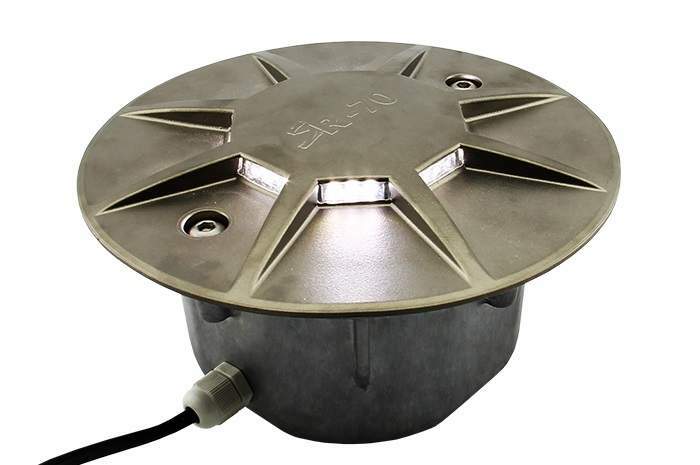 Sernis has introduced a brand new Led Street Light IL-LSL60WS. An electrical version of 60W in a smaller structure, same as 30W, which provides a great lighting and high energy efficiency with a low level of consumption. 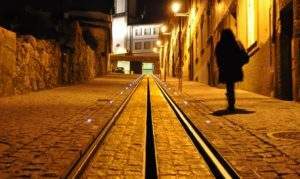 In 2011, dark points were identified at crosswalks across Braga in Portugal. The higher rate of accidents at these zones was a result of insufficient warning systems and bad driving. 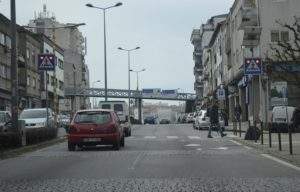 This situation threatened the security of all road users, especially pedestrians, with the most critical locations high traffic roads and school zones. Vehicles driving in wrong direction on the highways represent a serious risk to road safety. To prevent such danger situation from occurring SERNIS has developed the SR-WWID, a solar powered system that detects in real time vehicles in wrong way. SERNIS's Speed Meter is a solar-powered system SRL-SM30 developed to inform drivers of their speed. SR-RTIP-CWE Real Time Image Processing - Crosswalk Eyes is a new system that has been developed by SERNIS in order to guide people with visual disabilities when they cross the street in places that do not have traffic lights on crosswalks. Since 2004, SERNIS has participated in Intertraffic Amsterdam, the world's largest and most influential trade event for infrastructure, ITS traffic management, traffic safety and parking.